Cell, 2017, 171(7):1545-1558. SRPIN340 purchased from Selleck. Immunoblot analysis of various cancer cell lines treated with the indicated concentration of SRPIN340 for 24 hr with serum starvation. Cell, 2017, 171(7):1545-1558.e18. SRPIN340 purchased from Selleck. 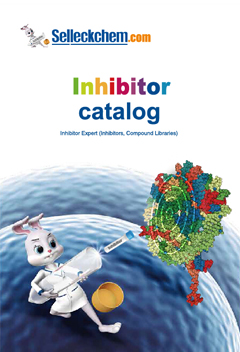 The only specific SRPK1 and SRPK2 inhibitor. Potential use in congenital diseases and viral diseases including HIV, HCV and HBV. Fukuhara T, et al. Proc Natl Acad Sci U S A. 2006, 103(30), 11329-11333. Karakama Y, et al. Antimicrob Agents Chemother. 2010, 54(8), 3179-3186. Dong Z, et al. Mol Vis. 2013, 19, 536-543.